SE-USB3-12A-20P is a new solution for mother board US 3.0 connection. 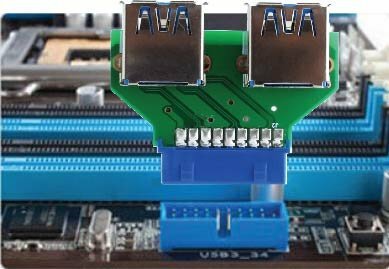 As more and more mother boards are coming with 2 internal USB 3.0 port with Intel 20 Pin connectors, but this 20 Pin connector may not fit the connection requirement of your devices. With this SE-USB3-12A-20P adapter, you can convert this Intel 20 Pin connection to 2 normal type A female connectors. You can connect this to external device or to other Sedna Internal USB 3.0 Front Bay or Sedna full series of Internal USB 3.0 Hub / Card readers. Copyright © 2011 Sedna Advanced Electronics Ltd.